There are a bunch of stories starting to come out based on some press and paper releases from the CDC yesterday. One that seems well done is this from CIDRAP: CDC notes progress, threat regarding hospital superbugs | CIDRAP. 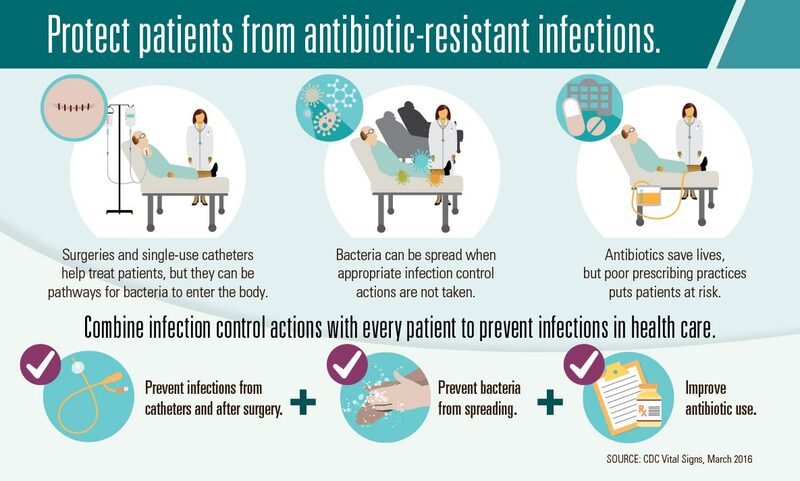 Today’s CDC report focused on the six most concerning antibiotic-resistant bacteria and found better progress against them in short-term healthcare settings. Basically, there is some good news and some bad news. Improve antibiotic use through stewardship. Of 18 #antibiotic-resistant bacteria identified as health threats in 2013 by CDC, nearly half cause healthcare-associated infections. 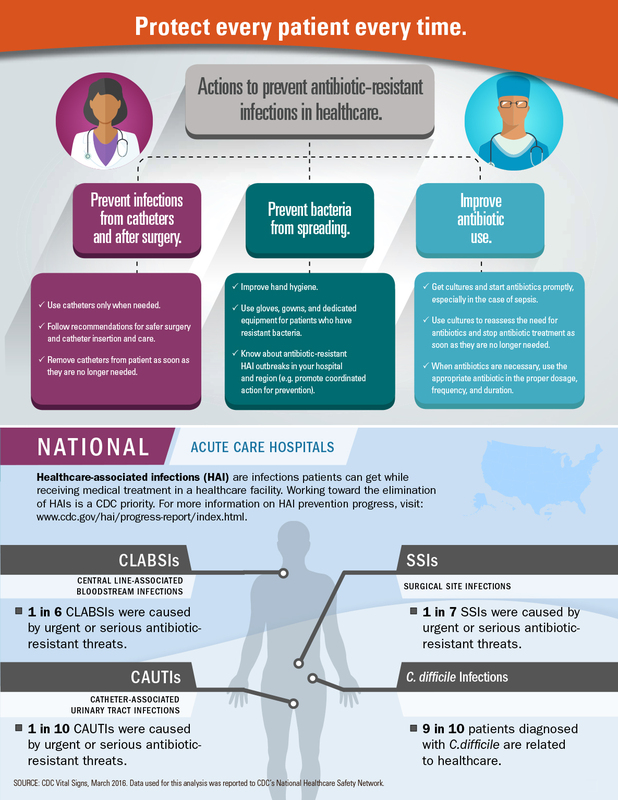 Approaches for Preventing Healthcare-Associated Infections: Go Long or Go Wide? Hospital organisation, management, and structure for prevention of health-care-associated infection: a systematic review and expert consensus. PDF. 1. Nothing about testing and improving air filtration to capture particles of the sizes of the known infectious agents. * improper directional flow of air associated with infected and susceptible patients. 3. Nothing about the nature and use of antibiotic or sterilization products on instruments and surfaces. What do all of these have in common? They all implicate the healthcare facility, There are large financial implications when infected former patients or their estates file law suits against hospitals and other healthcare facilities. Wrongful death suits are expensive, and these have been seen following a documented case of Legionnaire’s Disease in a building (including a healthcare) or other facility. I agree that the plan discussed starting at “CDC is calling on doctors …” is limited. However, though I cannot speak for the CDC here, my guess is they would say some of the topics you write about covered in the last four things I list: accelerating outbreak detection and prevention in every state; enhancing tracking of resistance mechanisms and resistant infections; supporting innovative research to address current gaps in knowledge; and improving antibiotic use. Guess as much as you like. It would be a good idea if your guesses were better informed. You can find CDC’s guidance documents on the web if you care to reduce the guesswork in your comments. For example, check out http://www.cdc.gov/coronavirus/mers/infection-prevention-control.html. or http://www.cdc.gov/coronavirus/mers/infection-prevention-control.html. there are lots more documents there that are easily accessible and not behind a paywall. I have been involved with the WHO and CDC and elsewhere on this topic, and I am not guessing. Your comments evokes anger since you really don’t know what you are talking about, but you try to cover your possible errors with the caveats, well, and “my guess here is….” Why do you bother to post if you are just guessing? To the extent that the measures I mentioned are covered by the CDC, they are only covered in such a general way in your post as to fail to communicate the importance of the detailed actions required to complement hand-washing which is the only specific item they identify. I think my point that it is typical in modern hospitals aggressively and broadly to promote hand[washing as a way to put the responsibility on individuals — visitors, patients, and doctors. this detracts us from the things the facility can do to help. I do not see anything that you said that addresses that fundamental point. You can find CDC’s guidance documents on the web if you care to reduce the guesswork in your comments. I am not guessing and will not apologize or caveat my comments. It is very clear to me in healthcare facilities in America and, to some extent, elsewhere, that the facilities are obsessed with reducing their liability and they are being sued for and paying huge settlements to affected patients and their estates. It’s all about money! Every years for the last several (maybe 6) years, I have been teaching part of a 2-week course on Airborne Infection Control in healthcare facilities at Harvard School of Public Health and Harvard Medical School. It is organized by Ed Nardell from the faculty of those two Harvard schools and by Paul Jensen from the CDC. Jensen travels the globe to help advise healthcare facility operators on what they can do to reduce airborne disease transmission. Nardell is one of the world’s foremost experts on TB prevention and treatment. He developed the course with assistance from WHO in Geneva. The focus in the course is on control of airborne disease transmission through facility design, operation, and management. The course goes beyond what the CDC guidance provides and, for that reason, CDC is now supporting the course. The focus is on the facility and the approaches available beyond what the CDC message conveys. The students are doctors, facility managers, architects and engineers who are responsible for facilities around the world although mostly in Africa. Most of the students’ facilities do not even have electricity. But they come because they need to know what can be done in such resource-scarce situations. I also was an external reviewer and part of the group that formulated the WHO guidelines on natural ventilation in healthcare facilities to prevent airborne infectious disease transmission. (available for free download — no paywall — at http://www.who.int/water_sanitation_health/publications/natural_ventilation.pdf). My focus is clearly different from yours, and clearly clearer than yours based not on guesswork but on experience and knowledge relevant to the subject at hand. I welcome your ideas and critiques. But I do not believe making your critiques personal is appropriate for this site. I note – I stand by my original post. I think it was useful to point people to the CDC and CIDRAP releases. One of our jobs here at microBEnet is to share information about what is being written about in regard to microbiology of the built environment. When I write blog posts my goal is not to necessarily editorialize about everything. Sometimes I think it is better to be indirect. I wrote “I don’t know about you but this does not overwhelm me as a plan …” in order to at least put the idea in people’s heads that this plan was imperfect. I get you do not like that approach. Your ideas are welcome and critiques too though I believe you are overreacting to a response I made to your comment (it is a blog after all and I was responding to your comment with some speculation). But please Hal keep the comments about the science and avoid personal attacks, they are not welcome here. This appears to be a recurring theme with some of your comments and in most other cases they are targeted towards students writing blog posts. This is a site with a major goal in building community. And your tone and personal attacks are not helping in that regard. I really hate to clutter up this site with this thread but I guess I do want to follow up on Hal’s comments in one regard. And others. So I again would guess that the CDC would say they are not ignoring these areas and that they are not part of some conspiracy to protect hospitals from lawsuits. My guess is this would not appease Hal in any way. But I guess that is going to have to do. And again, apologies for the clutter. Those infographics are really great. I hope they make their way into more hospitals. Feels like something like this should have existed earlier to bridge the gap between what researchers know about antibiotic resistance and what doctors practice in clinics. Maybe it does exist, but I sure haven’t seen antibiotic resistance addressed in the hospitals I’ve been to recently. Highlighting the rise of ‘superbugs’ and inadequacies in hand washing, he covered his work at the university looking at the role of touch surfaces in the spread of infection. Horizontal gene transfer (HGT) in bacteria plays an important role in the evolution of antibiotic-resistance, which has led to an increasing number of difficult-to-treat healthcare-associated infections. Professor Keevilâ€™s research shows that, while HGT can take place in the environment â€“ on frequently-touched surfaces such as door handles, trolleys and tables from stainless steel â€“ copper prevents this process from occurring and rapidly kills bacteria on contact. Professor Keevilâ€™s presentation concluded that a combination of effective cleaning regimes, and touch surfaces made from antimicrobial copper, could be invaluable in preventing the spread of pathogens and antimicrobial resistance. Andrew – I appreciate the comments. However I think it is important for people to know – you work for a company that markets “antimicrobial copper touch surfaces” http://www.act-surfaces.co.uk. I am guessing, but could not find further information to support this, that Bill Keevil has some role in your company. I note – I am skeptical of many of the claims made by companies promoting antimicrobial surfaces including those made of copper.